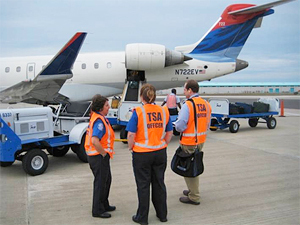 CSS supported the Office of Occupational Safety, Health, and the Environment at the Transportation Security Administration (TSA) by performing hazard analyses, indoor air quality investigations, exposure assessments, and ergonomics evaluations at more than 400 federalized airports nationwide. In addition to these support services, our safety professionals and industrial hygienists were engaged in evaluating new and proposed TSA screening equipment and technologies, including: explosive detection systems, explosive trace detectors, bottle liquid scanners, cabinet x-ray systems, advanced technology cabinet x-ray systems, and millimeter wave and backscatter x-ray imaging systems. Our team researched proposed technologies to identify potential hazards and then developed a profile of regulations, standards, and guidelines to be included in procurement specifications for vendors developing equipment for TSA. Once equipment was procured, our team provided detailed hazard analyses during operational testing in a controlled facility. These analyses included evaluations of noise, non-ionizing radiation, electrical shock, hazardous energy control, machine guarding, chemical emissions and temperature extremes. CSS also evaluated the equipment after installation at airports to determine if any hazardous conditions were introduced under actual operating conditions. These evaluations fulfill TSA's obligation to perform equipment and job hazard analyses and help ensure a safe work environment for more than 50,000 employees.